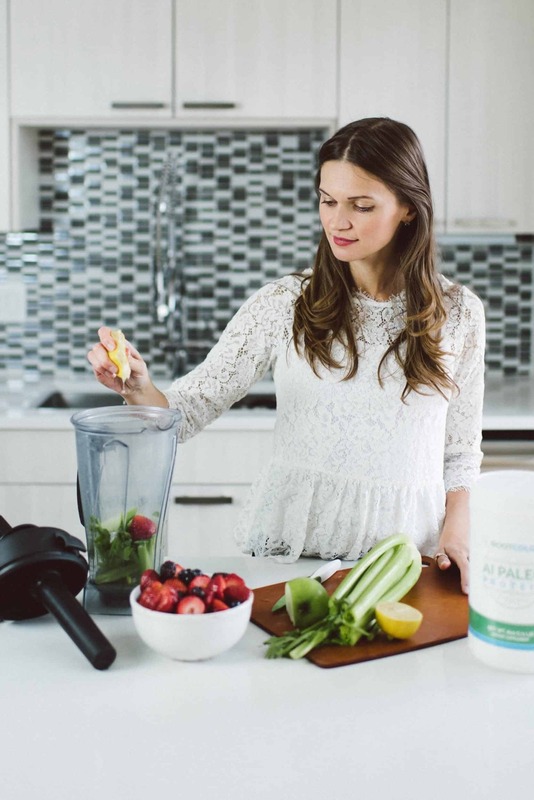 Before I received my Hashimoto’s diagnosis, I used to start each day with a protein smoothie. In some ways, this was a very positive habit; but in other ways, it was very much detrimental to my health, and I didn’t even know it. Protein is an essential macronutrient and helps us to build up our body to ensure that all vital processes are taking place. Protein is an important source of amino acids such as glutamine and L-tyrosine, which repair gut cells and create thyroid hormones, respectively. People eating the Standard American Diet, or vegan and vegetarian diets, may not get enough protein and can be at risk for protein deficiency. Some symptoms include: fatigue, trouble losing weight, brain fog, blood sugar imbalance, trouble building muscle, muscle wasting, intestinal permeability, and hair loss. Sound familiar? For general health purposes, you should be consuming about 0.45-0.55 grams of protein per day, for each pound that you weigh. (The official calculation is done by kilograms of body weight: 1.0-1.2 grams of protein per kilogram.) This translates to roughly 50 grams of protein per day, for a person who weighs 100 pounds. Higher protein intake (0.55-0.68 grams per pound of body weight, per day) is recommended for most older adults who have acute or chronic diseases. In this case, a person who weighs 100 pounds should aim for 54-68 grams of protein per day. Generally, the more active you are, the more protein you need. Bodybuilders need even more protein — as much as 1 gram of protein per pound of body weight — so a 100 pound person would want to aim for 100 grams of protein each day! Older people with severe kidney disease (who are not on dialysis) are an exception to this rule — these individuals may need to limit their protein intake, as their kidneys may not be able to properly process the protein. Having a protein packed smoothie in the morning can help kick off our daily nutrition and keep our blood sugar balanced, as well as help the thyroid gland (if low protein is a contributing factor). A protein powder mixed with blended foods can provide the body with predigested nutrition, allowing for better absorption of nutrients, even when our digestion isn’t perfect. The wrong kind of protein can be detrimental as well. Back in the day, I used to put whey protein and yogurt in my smoothies, not realizing that I was sensitive to dairy! Dairy proteins, casein and whey, are highly reactive for up to 80 percent of people with Hashimoto’s. My “healthy breakfast” was causing the autoimmune attack on my thyroid gland, and was also causing my carpal tunnel, acid reflux, and irritable bowel syndrome. Within three days of getting off dairy, my acid reflux and irritable bowel syndrome disappeared! My carpal tunnel resolved a few months later, and over time, my thyroid antibody levels decreased. Most protein powders on the market contain soy and dairy, which are two very reactive proteins for people with Hashimoto’s. While egg white proteins are also an option and can be less reactive, unfortunately, those with Hashimoto’s who start using them often find themselves with new onset egg reactions, because egg whites are difficult to digest for people with intestinal permeability. 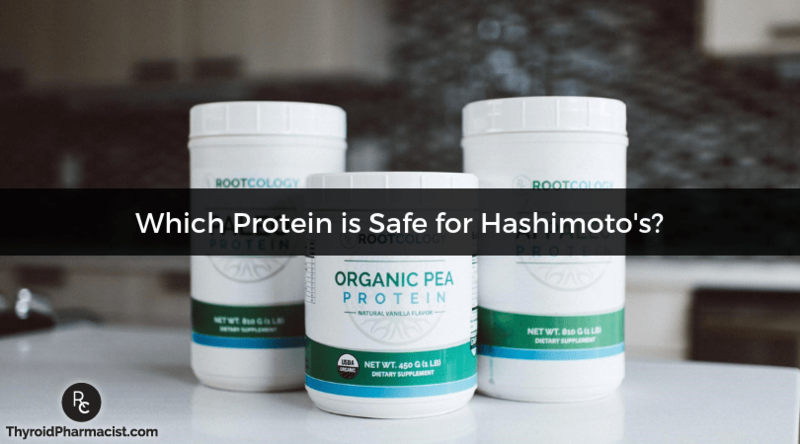 The protein powders that are best tolerated by people with Hashimoto’s, in my experience, are hemp protein, pea protein and hydrolyzed beef protein. Vegan, gluten, dairy and soy free, but it has a strong taste that doesn’t blend well with most foods and can be an issue for those with estrogenic concerns. Vegan, gluten, dairy and soy free, and has a mild taste. However, it is not compatible with the Autoimmune Paleo diet. Paleo and Autoimmune Paleo friendly. Gluten free, soy free and free of casein and whey (two very reactive proteins found in dairy products). Is a complete protein, meaning it contains the essential amino acids we need to survive. Hydrolyzed beef protein offers a special advantage, as it is less likely to cause additional food reactions due to the hydrolysis process, which breaks the protein into tiny pieces. I recommend using hydrolyzed beef protein for building up your body in the Adrenal Recovery and Gut Balance Protocols of my book, Hashimoto’s Protocol. However, many of the beef proteins currently on the market have added flavors and fillers, like stevia, which some people may react to. 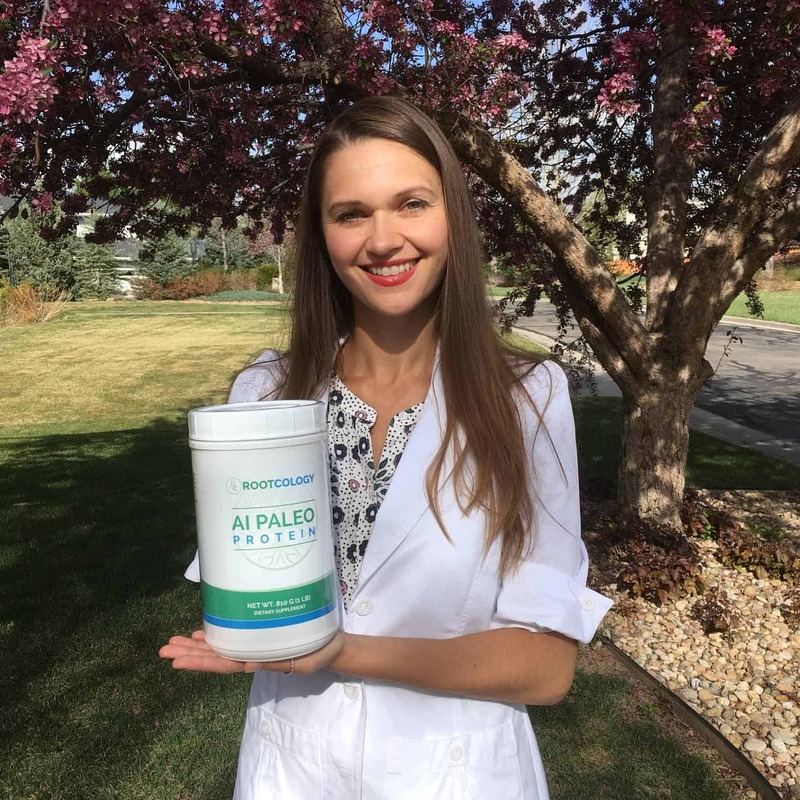 Many of you have expressed interest in a protein powder that is autoimmune-friendly and would adhere to the guidelines of the Autoimmune Paleo diet. And, as you likely know, this type of product has proven to be very difficult to find! So, last year, I created the ONLY autoimmune-friendly protein powder on the market! We have sold thousands of this product and have been able to help so many, which makes me incredibly happy! I’d ask you to trust me on this, but hey, I’d rather you decide for yourself. In fact, there is zero risk because every product in my Rootcology line has a 30-day, 100% satisfaction guarantee! All of the supplement ingredients have been carefully chosen by yours truly to address the needs and sensitivities of people with autoimmune thyroid disease. They are pharmaceutical-grade, tested by third party companies to make sure that that they have what the label says they have (and nothing more), and formulated to be free of potentially harmful fillers. So now you can have your smoothies and your health too — even if you’re following the Autoimmune Paleo diet! I also have a vanilla flavored version of the hydrolyzed beef protein, but please note that it does contain stevia and some light additives. Some people do enjoy the extra flavoring and compare it to vanilla ice-cream! Last, but not least, I have Rootcology Organic Pea Protein, which is gluten free, dairy free and soy free, as well as vegetarian/vegan friendly. I wanted to develop an option for you that would be great a fit, regardless of the protocol that you are on! Don’t forget, it’s a win-win with our 100% satisfaction, 30-day guarantee. P.S. You can also “Subscribe and Save” and get 10% off discount on your order. This is a great way to reserve your protein each month. P.P.S. What are people saying? Wondering if this would be suitable for SIBO ? Does it contain collagen ? This is fantastic news however being a vegetarian means I will not be buying this. It’s a shame there is not a veggie option. Lindsay- Recovering from adrenal fatigue and hypothyroidism when following a vegetarian diet is very challenging, as vegetarian diets are often carbohydrate heavy. Is it possible to recover with a plant based diet? If I substituted the meat in your recipes for a plant based protein such as nuts, would that be just as effective? I don’t agree with animal farming methods, even organic farming….. It’s better, but not the best solution for the animals. Based on this, I follow a vegan diet. Jenni – thank you for following this page. Jenny, I don’t like huge factory farms. I suggest finding a local small family farm that raises grass-fed cattle and healthy chickens in a pastured, open environment, and patronizing them. That is what my family does. It makes a huge difference. The cows graze in field all day during the summer months, are only fed organic corn in small amounts with hay feed in the winter, and hormones are not used. No feed lots. Cleaner barns and better care of the animals. They work hard to do things the right way, and so I give them my business. You can also find 100% grass-fed beef in areas where the cows graze more months per year due to less severe winters (very little snow). I found that pea protein is about the best for the skin, so that will help with the issue of intestinal tissue permeability. Also, the pea is high in fiber and is 100% VEGAN and full of micro-nutrients. I am aware that many of the Hashimoto’s victims cannot have egg or soy, or chametz (which is leavened wheat, perhaps bleached and so forth.) Re: gluten, you might try “unleavened” matzah (kp) using the whole organic grain which is n.o.w. available, and see “i.f.” that still gives you problems, taken in moderation with some fresh spring water. You might be able to build up your tolerance. However, for a protein additive, since many with Thyroiditis a.r.e. horrified that they have to eat meat, pea protein is superb, provided that you balance that with some powdered brown rice bran. The vitamin and fiber value is peerless and the taste is delicious. All kinds of herbs and fruit powders, without all of the sugar, can be mixed in for flavoring. A little stevia can be used if one is not depleted in the adrenals. And if so, one can make a veggie smoothie or a green drink with watercress, and arugula, and add some ginseng. Merlina- Thank you for sharing! I know you have covered this before, but I am not finding the reference now. Would you repeat your source for nontoxic personal care/body care products, please? Thank you. Is Bone Broth protein a good alternative? Emile- Thank you so much for following this page! What works for one person may not work for another! Here is an article I wrote about Bone Broth! So excited!! I have been trying to gain weight for the past year and the other protein mixes I’ve tried made me feel bloated and I couldn’t tolerate them. I will be excited to try yours! Thank you so much! Michele- Thank you so much for sharing and support! I look forward to hearing your progress on this page! Most people with Hashimoto’s will experience weight gain, and so of course that’s what gets the most focus, but some people actually experience weight loss, or they can’t keep their weight on. I always avoid “hydrolyzed protein” — that is most typically the lying way that industrial food sellers hide MSG. How is your hydrolyzed beef created and does it have any of the quite neurotoxic MSG? Perhaps there are other ways of hydrolyzing proteins? Please explain. I have a daughter who is 10 diagnosed with hashimotos. I was wandering what book would be best for me to purchase to be able to gain an insight in how I can help her with her hasimotos as she is so young. My finances are a little low and I cannot afford to purchase all the books you have out there unfortunately. She is a pale thin girl having blood,tests twice a year and her blood results seem to be quite stable although her auto antibodies are high all the time. She is quite an anxious girl who does seem to get some stomach pains etc after she eats etc. any information in regarding her diagnosis would be very helpful. Hi- I am actually anti-palio due to the havoc raising cows is causing the planet. Please watch the documentary “Cowspiracy” or “What the Health.” It will show you why cattle raising is not sustainable. So my question is – do you have a product that is veggie based? Karen – There is actually considerable evidence in favor of the sustainability of Paleo diets. Recovering from adrenal fatigue and hypothyroidism when following a vegetarian diet is very challenging, as vegetarian diets are often carbohydrate heavy. I started to try one about 10 days ago, made in Canada where I live. advertised as Paleo suitable…….it does not seem to agree with me, and I wonder when I read the ingredients what you think. Super serum beef protein powder, beef protein isolate, Stevia, natural vanilla flavour , natural french vanilla, coconut oil powder. I am a no gluten, soy, dairy, eggs, grains and some nightshades and some legumes give me problems. I was managing well the last 2 years , then all of a sudden 3/12 ago it all fell apart. I may have had EBV many years ago. Testing in Canada is limited as are functional medicine Dr’s here. Judy – I developed my own to provide safe and effective supplement solutions for people struggling with autoimmune thyroid conditions. 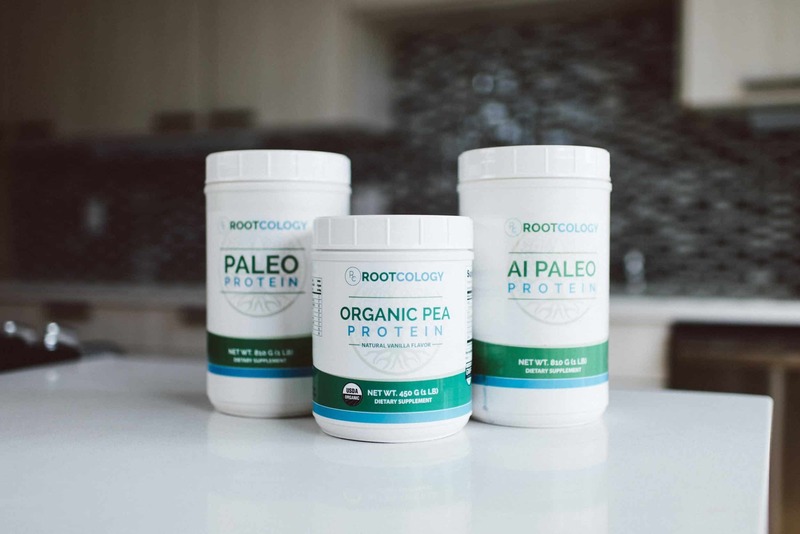 Rootcology supplements are composed of high-quality premium, gluten, dairy, soy, pesticide, and toxin-free ingredients and undergo third-party testing to ensure that the ingredients on the label match the ingredients inside each bottle. For people who react to beef, I’ve found pea protein to be less reactive. I’m very interested in trying your Rootcology protein but I’m also from Canada and don’t think it is available here. I have no issues with the beef protein protocol. Beverly – thank you for following this page and for your support. Could you please contact info@rootcology.com, my team will be happy to answer your questions. Forgot to add. Judy is right as to the lack of functional medical dr’s in Canada. I’m tempted to see someone in Winnipeg, Manitoba but living where I do makes travelling a major excursion. Plane flights are expensive or it’s a 9 hr drive. I would like to know how much the protein powder is? I don’t see any of the ingredients listed on the Rootcology products. I know you have selected them to be safe for Hashimoto’s and AI Paleo, but I still always like seeing the ingredients. Kim – thank you for following this page. If you select a specific Rootcology product, it will bring up a page for the supplement details, which includes a listing of the ingredients. You can also select the label from the image options, to view the rest of the information. You have to hover over the image, once selected, to view a zoomed in version. Paula – thank you for following this page and for your interest in Rootcology products. Could you please contact info@rootcology.com, my team will be more than happy to answer your questions. Do you sell samples of the protein powder to try before buying the full size? Sandi – thank you for following this page and for your interest in Rootcology. Could you please contact info@rootcology.com, my team will be more than happy to answer your questions. Does this come from grass fed cows? Melissa – thank you for following this page. Could you please contact info@rootcology.com, my team will be more than happy to answer your questions. Hi. I have Hashimotos and purchased your book and really want to follow your protocol. Over the years I have incorporated many of the things you suggest. I have noticed an increase of symptoms though with bone broth, gelatins and protein powders. I also am trying to rid myself of chronic Epstein Barr virus and as a result am trying to make sure my intake of arginine is not excessive. The arginine content is high in all animal protein powders and unfortunately I cannot eat legumes, nor dairy. Do you have any other suggestions to substitute for your shakes in your book? Thank you so much for all that you are doing for those suffering with thyroid issues. Unfortunately, everyone is different, and you may need to adapt your smoothie to your own sensitivities. Dear Isabella, I have Hashis adrenal fatigue, fibro, chronic fatigue and figured out that I am very sensitive to histamine. I get severe headaches and palpitations if i eat high histamine foods. I am also a vegetarian and want to start with some animal protein is your protein powder safe for me? I can bring my self to eat meat but want to try a protein powder that might not be vegetarian. I am sick help. Shalini – thank you for following this page. Darn–thought I had finally found something. Can’t do stevia. (Can’t please everyone!) I am a recovering from gut issues after 13 years of being vegetarian/low fat and then gluten-free/ vegan and have now developed issues with pea protein and other options. Although I ethically do not agree with eating animals, I was getting worse and worse. I found out finally through allergy testing, elimination diets and histamine reactivity (finally with hives and anaphylaxis) that it was the beans, legumes, grains and cruciferous vegetables that were doing me in. I think we all have to find our own way and do the best we can. Thank you for bringing these issues to light that most doctors think we are making up. Lili – You certainly have my sympathy. So many people with Hashimoto’s are people who are or have been vegetarian or vegan in the past. I hope you are feeling better now you have made these discoveries. Hi. I am currently reading your books and want to start the protocol you suggest. Which brand of coconut milk do you suggest? The Trader Joe's brand is great (when it's in stock), and I also like the Aroy-D brand you can get on Amazon. Look for one that is free of additives and carrageenan. Hope that helps! So many of the recipes call for eggs I have an egg sensitivity. What do others do that have egg reactivity? Candace – Thanks for your question! If you are sensitive to eggs then I would simply substitute it with another animal protein of your choice. If you want to use it for baking or binding, applesauce or gelatin can be very useful. Good luck! I am wondering if my GP is correct in saying my thyroid “is dead” after 20yrs of taking thyroxine ? My autoimmune antibody level is very high. T3 in the 4+ level. It’s hard to get anyone to listen as you have stated yourself. (home brew) daily and fermented foods like Kim chi. Are these foods ok in a hypothyroid or Hashemite diet ? Sue – Thank you for following this page. I’ve just begun implementing Hashimoto’s Step One Liver Protocol TODAY!! I need to eat in between meals, otherwise I’m so hungry/shaky, etc., What snacks are allowed on the Liver Protocol? By the way, my first smoothie of the day was delicious! Thank you. Catherine – thank you for following this page and for your support. Thank You! By day two already noticing an improvement since drinking the root cause smoothie in the mornings and a bit in the afternoon. I feel sustained. Moonyeen – thank you for following this page. Could you please send your feedback to info@rootcology.com. I live in Canada and was not able to place an order. Will this be an option in the near future? Was looking forward to starting on the liver protocol. My husband just found the Bulletproof podcast that featured you and insisted I listen to it. I was diagnosed with Hashimotos when I was 24 years old, that was 23 years ago. The only symptom I recall having at that time was heart palpitations. But that was enough to prompt my doctor to do bloodwork (after the wearing the 24 hour heart monitor) and eventually discover the thyroid condition. I have been taking Synthroid ever since. My dosing has gradually been increased over the years and I make sure to see my endocrinologist twice a year. The only true symptom that I can say I have experienced over these past 23 years is extreme fatigue. My husband can’t stand the way I fall asleep on the couch by 9pm each night! Sometimes I wonder if I also have chronic fatigue. Despite my medication, the fatigue has really never improved. In addition to the hashimotos, in the past 8 years I have been diagnosed with something called DIV (desquamative inflammatory vaginitis) After some research I discovered that this too is an autoimmune condition. I have been receiving treatments for a while, with no true changes. Last year, at a regular physical, bloodwork showed elevated glucose levels, bordering on diabetes. As I developed gestational diabetes during my most recent pregnancy, placing me at higher risk for diabetes, my doctor told me to eliminate all sugar from my diet. This included carbohydrates. Although this was a tough transition for me, as I tend to be a very picky eater when it comes to vegetables, I stuck with it. He also noted my vitamin D levels were extremely low and put me on a vitamin D regiment. At my 3 month follow up I had lost 20 pounds! In addition, my frequent migraines had ceased, heartburn went away and some recent joint pain I was experiencing was gone! The fatigue; however, is another story… I read some of your articles (my husband has suggested buying your book too!) and find it interesting that you recommend eliminating gluten, which I have already done. I also note you recommend eliminating dairy. I would love to finally get rid of the fatigue, but I love cheese! After cutting (most) carbohydrates from my diet, all I pretty much eat now is meat, salads, nuts and CHEESE. I will probably have to give it a try one of these days, but staying away from bread, pasta, french fries and potato chips has been difficult enough. To top it off, I’m allergic to chocolate! Keeping cheese in my diet helps to keep me happy. Anyway, I’m glad I found you, and look forward to reading/learning more! Any advise would be great! Hi Izabella, thank you for writing Hashimoto’s Protocol, I am loving it!! Shakeh – thank you for following this page. Please, understand that due to liability issues, I am unable to answer specific medical questions. Thank you, Izabella, for your hard work healing yourself and for now helping others. I thank God for the many wounded healers helping to change the face of medicine. Although I am under significant stress caring for my 93 yr old Mother in our home and helping my husband with a construction related business (still recovering financially from the recession), I have learned to go into God’s presence for help and peace. I know that my circumstances are not changeable at present and that they ARE affecting my health. However, I am not hopeless. I know that just as God has used your struggles to help others He is giving me eyes to see/empathize with others. I still need to do the hard work of healing my body, however. When you can’t stop the world and get off to rally limited mental focus for this kind of healing it is discouraging. The more I spot read your book and follow feeds like this, however, a plan of action is there. THANK YOU! Betrayal/The Autoimmune Solution, The Truth about Detox and following the introductory episodes of the Green Smoothie Girl) but not following through. (easy to do just sitting on the computer.) Even now I am considering traveling 2 hours to Atlanta to work with a doctor who has trained with Dr. Benjamin Lynch regarding genetic mutation. (I ‘ve done that testing with a functional doctor here in Bham but I don’t think they understand how to apply that information to my recommended supplement regime). I don’t feel well if I take it all (wired and tired). I guess I’m hoping to at least solve one problem in order to give me the energy to strictly adhere to the AIP diet which i know will be the foundation of my healing. I have changed so much of my diet but haven’t eliminated the morning coffee, nightshades, nuts and soy(low glycemic Kind bars keep me from eating gluteny desserts) and occasional gluten (a couple times a week). I did have my Armour increased to 90 mg in January. I’m wondering if just ordering the tests in your book to look at specific toxicity would be a next step before spending more money seeing another doctor. ( I already know I have a significant Candida overgrowth.) Would that tell me whether the gentle detox from the AIP diet would do the trick or whether a short term more aggressive vegan detox would be in order? I know it is important to detox one system at a time. Perhaps i could get a small vacation to focus on that. Forgive me for rambling on. I obviously am having trouble making decisions. I feel as though I am trying to run in chest deep water mentally most of the time. Mainly commenting to thank you for the comprehensive nature of your work. There is SO much help in your book! Just need to pick something and do it! I have Hypo. Will the shake work for me? I am looking to build muscle and not irritate my thyroid. Sumera – Thank you for following this page. I along with 3 of my sisters all have Hashimoto’s and the one also has rheumatoid. I was wondering if you recommend Dr. Axe products and is it ok to take while doing your protocol? Before I discovered your protocol book, which I’m reading right now, I had actually joined his healing leaky gut group and I have bought a lot of his bone broth protein powder. Is that ok to take? I know you recommend pea protein or hydrolyzed beef protein but Dr. Axe’s products are made from chicken bone broth. Just curious what your thoughts are on that and if would be ok to still take all that while doing your protocol since I have a bunch of it. We are each so unique. I really encourage each person to follow their own customized path to health. Here are a couple of articles that you may find helpful. According to my food senstivity results I need to avoid green peas and beef, with that said would your pea protein or hydrolyzed beef protein be ok to take? I am really trying to find protein that can accommodate, so I have ruled out anything with green pea and beef , however interested to understand if the way you make the pea protein and if hydrolyzed beef protein if they would be compatible? Tammy – thank you for following this page. For questions pertaining to the supplements please contact my team at info@thyroidpharmacist.com and they will be happy to help you. Hi, I have been tested sensitive to yeast and recommended to avoid hydrolized protein. What is your opinion about this product and brewers yeast sensitivity? Sandy – Thank you for following this page. Did you know that reactive foods trigger an inflammatory response in the GI tract, leading to malabsorption of nutrients (gluten sensitivity in particular has been implicated in causing a Selenium deficiency, a well known risk factor for Hashimoto’s), and can also produce intestinal permeability whenever they are eaten? I tried Rootcology Paleo Protein this week (not AI version), and I was instantly ill. It’s been two days, and my stomach isn’t right yet. Half way into my smoothie (unsweetened coconut milk, organic frozen berries & 1/2 scoop of protein), and I could feel my innards swell like nothing I’ve ever felt before. There was no sleep that night due to pain. Is there any ingredient that would create such an immediate reaction? I have no known allergies, but I do have Hashimoto’s thyroiditis. Huge shame, as it’s the very first protein shake I’ve tasted that I really liked. Karla – – thank you for following this page. For questions pertaining to the supplements please contact my team at info@thyroidpharmacist.com and they will be happy to help you. I’ve been on the Hashimotos protocol for one week now. At first I felt an instant decrease in my inflammation levels. Now, 8 days in, my joint pain is back and overall body inflammation as increased from before the protocol. My wedding rings went from slipping off my fingers day 2-3 to living on the shelf because my hands are swollen. Do you think this could be a sensitivity to the pea protein or could it be something else in the protocol? Lindsey – thank you for reaching out. <3 For questions pertaining to the protocols please contact my team at info@thyroidpharmacist.com and they will be happy to help you. I want to comment on the recommended amount of daily protein consumption referenced in the article. I’m reading conflicting information from functional medicine professionals about how much protein is an appropriate amount for an individual. So, from my research I say this is not a cut and dry number as the article mentions, but something that must be personal, like everything else about our health journeys. For example, the protein amount can change over the course of healing, so tracking and gauging protein/carb amounts is critical. Trying different amounts to see how you feel could be huge. I can testify to that for my own healing. After three years, I have found that I can tolerate more protein- I eat 6-8 oz (200 grams) of light animal protein (fish/white meat) per day. When I started on my health journey, my digestion was so poor, I could barely tolerate any meat. Also, I want to comment on powdered proteins and smoothies in general. Depending on how our digestion is (for example, can we tolerate cold smoothies in the morning? ), will be a factor in whether or not we can do smoothies, regardless of what kind of protein powder we use. My intestines were so messed up and inflamed, I could only eat warm, cooked food for 6 months. And many of us cannot digest fructose (fruit), or raw greens when we’re really sick. So, tread wisely when testing products. I may be unique, but I do better with wild red meats (like bison) than beef. And I cannot tolerate peas yet, as they are a member of the Fabaceae (legume) family, which includes peanuts and beans, which I react to. So, we shouldn’t be discouraged if we cannot yet tolerate protein powders/smoothies. And if there are some folks out there like me who need more protein, do your homework and figure out what works for you. In the article you commented that Seniors and those with Kidney disease, not on dialysis should limit their protein intake. Is there some reference or source you could advise that would tell me the range of protein for a limited protein protocol? Thank you. Linda – thank you for following this page. For questions pertaining to the supplements please contact my team at info@thyroidpharmacist.com and they will be happy to help you. Unfortunately for me I became very sensitive to many foods. Hemp, pea protein, cassava, and flax and nuts. Not many choices left. Elizabeth – thank you for following this page. Did you know that reactive foods trigger an inflammatory response in the GI tract, leading to malabsorption of nutrients (gluten sensitivity, in particular, has been implicated in causing a Selenium deficiency, a well-known risk factor for Hashimoto’s), and can also produce intestinal permeability whenever they are eaten? I genuinely believe a Paleo diet could be something good to try. I’ve Hashimoto’s and PCOS. My sister died of heart attack and thyroid storm several years ago. I’m not clinically overweight but I’ve a belly and love handle that is almost impossible to shrink. Been losing hair too. My biggest concern is I’m a vegetarian. Which one would you recommend from your line? hemp / pea protein? Also, can you recommend some supplements from your store for my situation as well? Mabel – thank you for following this page. Recovering from adrenal fatigue and hypothyroidism when following a vegetarian diet is very challenging, as vegetarian diets are often carbohydrate heavy. Vegetarian sources of protein such as legumes (beans), dairy, grains, soy and some seeds may be incompatible with trying to heal a leaky gut, which is almost always present with Hashimoto’s. Pea protein is an alternative that may be easier to digest and is less likely to cause food sensitivities. Since when I eat out I think I might not be able to avoid all the traces of allergen, is it possible to mitigate the effect of allergens by taking digestive enzymes? Mabel – thank you for reaching out. I use Gluten-Dairy Digest whenever I’m eating out at a restaurant and am concerned about gluten and dairy cross-reactivity. It will help to minimize any adverse reaction you may experience from gluten and dairy proteins. Unfortunately, the enzymes don’t fully break down gluten and dairy so I don’t recommend indulging in a pizza just because you have these enzymes. Here is a link you can check out. Richard – Thanks for your question! I’ll add this to my list of future article possibilities. I would love to hear more about your experiences here on this page! I spoke to a naturopath in Australia today and she advised that i check you out. Ive read everything on your page and am super excited to hear of your results with hashimotos. Unfortunately i have a red meat allergy due to tick so cant eat your smoothie blend…and its so meat based i’m wondering what i should do???? I have had a similar experience. After searching without success for a long time, I dropped off whey protein (and cheese). And my antibodies slipped into the basement. The doctors thought it was a mistake of the lab. In addition I took Lugol‘s. And now the values of my thyroid are ok too. I feel good and I‘m happy. Hans – thank you for sharing your journey! Are any of these protein powders LectinFree? Hi Izabella, I would like to try hemp protein, but could you explain why hemp would be a concern? I also read on Dr. Axe’s website that people with autoimmunity should not consume hemp. What are your thoughts on this? Sara – thank you for reaching out. Everybody is different, and what works for one person may not work for the next. Pea protein and hemp protein are plant based proteins. However, while generally well tolerated, they are not complete proteins (they don’t contain all essential amino acids), and hemp protein may be problematic for some people with estrogen dominance concerns. Here is are some articles you might find helpful. I not only hashimoto’s but also severe eczema. I have been following an eczema detox diet for about 8 weeks and did notice an improvement in my eczema. When I had my thyroid levels tested not long ago my TPO’s increased and my hair is following out again! I am amusing it is because of the legumes and rice and the other limited food I was on. On this diet there is a lot of talk of amines and histimines. I am wondering if your AI Paleo protien, because it is made of bone broth as opposed to beef broth, has amines or histimines? I was wondering why collagen protein isn’t mentioned as being good for hashimoto’s disease. Can you explain why? Thank you. Lisa – thank you for reaching out. Collagen is made from the connective tissue of animals, such as hooves and bones, where hydrolyzed beef protein is made from beef itself. Hydrolyzed beef protein goes through a process called hydrolysis. This process breaks the beef down into tiny parts, which allows for less potential reactions with hydrolyzed beef, compared to collagen and bone broth proteins. Collagen and bone broth, although considered protein sources, are not complete proteins, meaning they do not have the 9 essential amino acids that our body needs for muscle and tissue repair. Additionally, they only have about 11 g or so of protein per serving, compared to about 27 g in the hydrolyzed beef protein. Collagen and bone broth protein, therefore, are not recommended for long term use as a protein supplement. However, they do have their own set of benefits, including supporting the gut lining and skin, lubricating joints, and increasing strength of the hair and nails, which may make collagen a great addition to your protein powder. I hope this helps. would this be ok for someone that has Fatty liver as well as Hashimoto’s? Trying to reverse fatty liver and I am finding the task of figuring out what I can eat for both of these issues very overwhelming. Thank you for sharing so much valuable info in your blog and the Root Cause. Unfortunately, finding quality supplements and foods has been very challenging where I live (Spain) even with online options. Can you tell me if organic Chia or Pumpkin Seed protein powder is a good alternative to pea protein? I’m unsure if these are safe on an autoimmune diet for Hashimoto. Nadja – you are very welcome! I am so sorry you are having trouble accessing a good protein powder. I recommend a protein powder free of allergens, including: sugar, artificial sweeteners, gluten, dairy, soy, and grains (such as rice and corn). Here are some recommendations below that you may want to check out. I would love to consider these products. Have all the contributing food sources been tested for glyphosate? I am a vegetarian with Hypothyroidism for over 10years. Please can you recommend(brand name) me a plant based , Thyroid friendly protein powder as I am looking to loose weight. Chetna – thank you for reaching out. As a pharmacist, I can tell you that many supplements are ineffective, and some are even downright unsafe. The truth is that most supplement companies do not undergo the same scrutiny and testing that pharmaceutical products do. This is because many of the tests required of pharmaceutical companies are voluntary for supplement companies and most companies do not take the extra steps to test their products to ensure safety and purity. Thank you Dr Isabella for your prompt response. I would be going ahead and booking my protein supplement with Rootcology. However what is the best way to consume this powder(Before or after workout, with water or plant based milk) also is it safe to add fruits and make a smoothie. Can this powder be added to breads and muffins? Chetna – thank you so much for your interest in Rootcology! The protein powders are great for smoothies! Here is a link to an article I wrote and if you purchase the Rootcology protein powder you will receive a FREE copy of my Root Cause Smoothies eBook!